Willie Bourbon takes a swing. Bourbon homered in Tuesday’s game but the Wildcats still lost to Notre Dame. 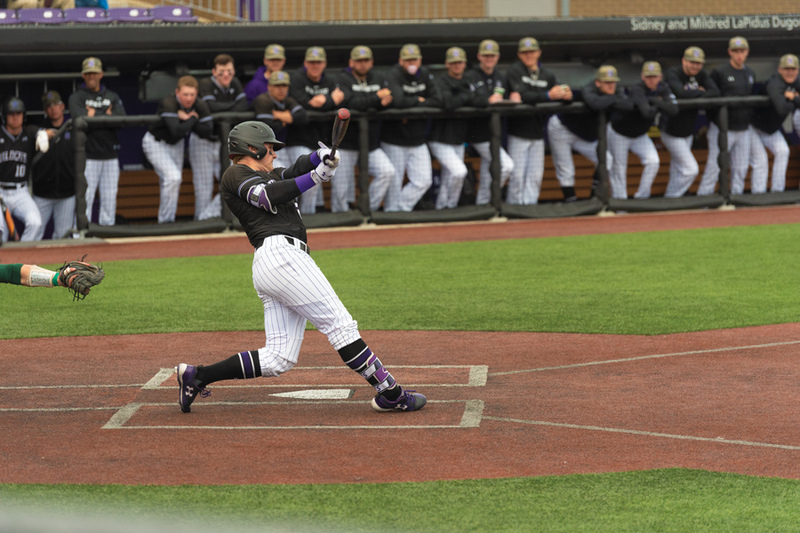 When Northwestern and Notre Dame met last month in South Bend, Indiana, the Wildcats pitching staff allowed only five hits and shut out the Fighting Irish offense in a 2-0 victory. Tuesday’s game at Miller Park looked, for a while, like another low-scoring contest. After five innings, just two runners had crossed home plate and both teams had scattered only nine hits. Then the fifth inning became the sixth. Over the final four innings, Notre Dame (24-25, 12-15 ACC) exploded for 17 runs while NU (16-30, 6-18 Big Ten) could only counter with 10 as the Fighting Irish won 19-10. The Fighting Irish first scored in the third inning. With two outs, Cole Daily doubled and then Jake Johnson walked to put two runners on for Nick Podkul. Podkul turned on a two-strike pitch as both Daily and Johnson scored on the play. In the sixth, Notre Dame plated three runners on an Eric Gilgenbach 2-RBI double and a single from Daniel Jung. Podkul then turned the game into a blowout in the seventh. After Daily and Johnson reached base again, this time to start the inning, Podkul blasted a three-run homer to make the score 8-0. Matt Vierling followed up Podkul’s blast with a wallop of his own. Gilgenbach, Podkul and Alex Kerschner— who hit a grand slam in the ninth — all finished the game with 5 RBIs while the Fighting Irish ended with 19 hits. The Cats put up a crooked number of their own in the bottom of the seventh. First, sophomore left fielder Leo Kaplan hit a sacrifice fly with the bases loaded. Then, after NU reloaded the bases, junior shortstop Jack Dunn ripped a bases-clearing triple over the head of Gilgenbach in right field. Sophomore second baseman Alex Erro then singled in Dunn. Two more runs came across in the eighth on a single from freshman right fielder Casey O’Laughlin and a wild pitch. Home runs from freshman catcher Jack Kelly and Bourbon in the ninth brought the the Cats’ run total to 10. On the mound, freshman right-hander Anthony Alepra had the longest outing of a non-weekend starter this spring. Alepra threw into the sixth inning and got 10 of his 15 outs via fly ball. For most of its midweek games this season, NU utilized a bullpenning strategy with most pitchers throwing only a single inning at a time. Allen said they were planning on using the strategy again, but the way the game played out resulted in the strategy being scrapped. The four relievers who followed Alepra struggled with command as they walked nine batters and hit three more. Bourbon said he thought that those base-on-balls were a major difference in the game.